Today, I am going to take a look at Mint, a popular online personal finance tool that’s free for everybody. I just started to use Mint recently and don’t have all my accounts linked to it yet, but from my limited experience, Mint seems to be a very solid online tool. From the minute I started to setup my Mint account, I began to like it because, unlike other online tools that I tried, signing up with Mint is probably the simplest. It asked only the email address and zip code to get started. Many other sites will ask as much personal information as they can and those information actually has nothing to do with money management itself. After setting up an account, which takes only a couple of minutes, the next thing to do is to link your external accounts, such as bank accounts, credit card accounts, and brokerage account to Mint. This is the critical step because you can only start to manage your money in Mint after you connect your account. At first, I was trying to link my ING Orange Savings Account, but ran into a lot of trouble because of the security questions that I was asked when trying to sign in my ING account. Interesting thing is I am pretty positive that I never set up some of the questions. Anyway, after a few failed attempts, I gave up and linked to my Bank of America Checking Account instead. Once the account is linked successfully, you can view all the transactions of that account. Not only Mint displays account transactions for up to three months, it also shows how my spending compares with national average, which is pretty cool. Mint also allows me to search a particular transaction from the page. If I want to take a look where exactly my money went, then I can click the Trends button on top of the screen to show transactions in categories, as shown in the following screenshot. Knowing exactly how I spent my money is important for budgeting. 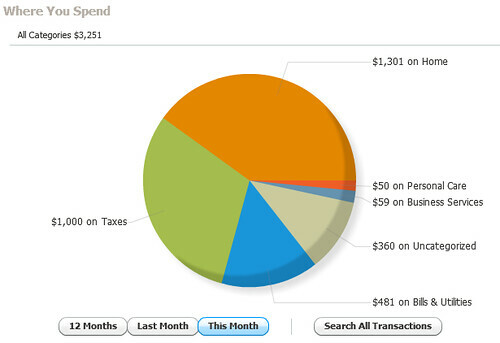 The way that Mint presents spending in each category makes it easier to compare the money spent in each category with monthly budget. Another feature I like about Mint is it Ways to Save function. Since I only linked my BoA checking account, which doesn’t pay me any interest, Mint shows how I can save (or earn to be exact) $221 by putting that money in a savings account. In this case, Mint use E*Trade Savings Account as an example. Though E*Trade may not be the account that I want to use as a savings account, the Mint Ways to Save at least severes the purpose of reminding me that there’s no reason to put excessive cash in a checking account that earns me nothing. I am still in the early stage of exploring all the functions Mint has to offer. But so far I think it’s a pretty nice tool with some solid features. I will add more to this review when I discover more. This entry was posted in Personal finance reviews and tagged Budget, Mint. Bookmark the permalink. Both comments and trackbacks are currently closed. I like the straighforward review, with realistic examples. I’ll be looking into Mint myself soon. @andy: I am glad you like the review. Mint is pretty good I think. It even sends me alert when it detects that my spending is over the budget.